WE SPECIALISE IN INTEGRATED LANDSCAPE DESIGN TO ENHANCE THE ECOLOGICAL, PRODUCTION AND AESTHETIC GOALS FOR YOUR LAND. We recognise the diversity of needs for our clients and create a customised design approach, tailored to your unique goals, time and budget. Landscape rehydration strategies including erosion gully repair, wetland construction, subtle water harvesting contours and keyline ploughing. Agroforestry for Timber, Firewood, Shelter, Fodder, Fire protection, Beauty, Land repair, Habitat and increased Land Value. 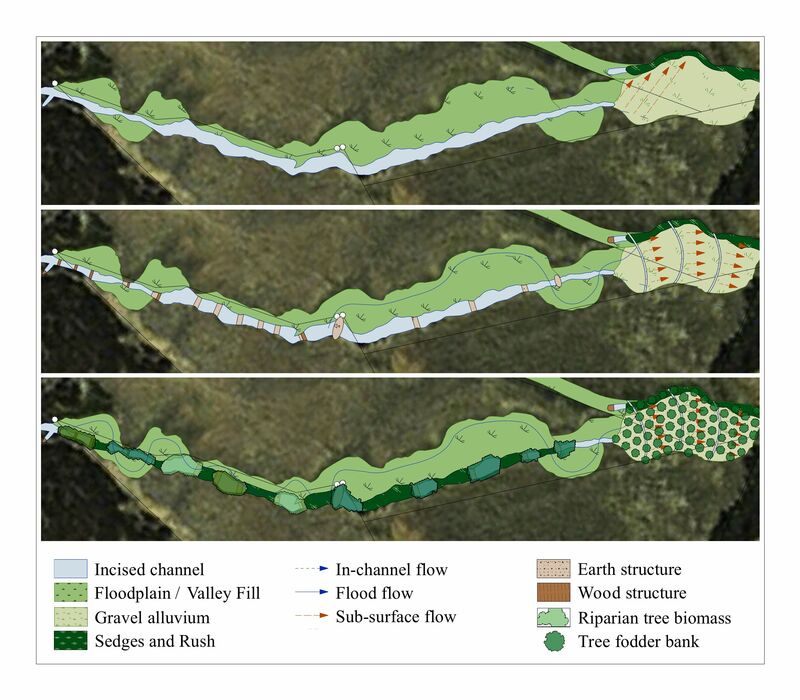 The above is a design example in which minimal physical interventions have been made, using locally available materials, to address the ongoing causes of degradation in an incised channel and to provide ideal conditions for vegetation to establish and thrive. With careful planning, the result is a dense biological sieve which reinstates the passive flow patterns which existed in this valley pre-degradation. A functioning landscape is restored, with increased water retention, biomass production, functioning biodiversity and soil building capacity available to the landholder to utilise and enjoy. We also have a solid network of expert consultants in the field of sustainable agriculture whose input we draw on and coordinate where appropriate. Contact us for an outline of our design process and pricing schedule.